Chelsea manager Jose Mourinho has been fined £8,000 and warned about his future conduct after being sent off in last month's 1-0 defeat at Aston Villa. 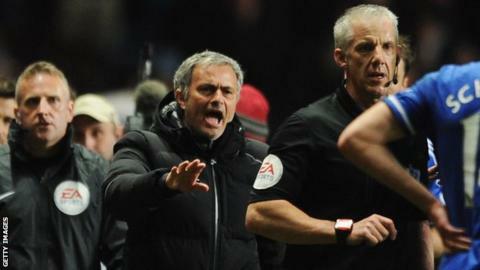 He was dismissed after walking on to the pitch to speak to referee Chris Foy seconds after Ramires was red-carded. Mourinho is unhappy and frustrated by the fine, and is considering an appeal against the decision. "I don't know why I was sent off," he said after the match. "I asked, but the referee refused to speak to me." Ramires was shown a straight red card for a two-footed tackle on Villa's Karim El Ahmadi, an incident that sparked a touchline fracas. The Portuguese had denied an improper conduct charge when he appeared at a personal hearing on Wednesday. He is expected to wait for the written reasons behind the charge from the Football Association before lodging his appeal. Mourinho claimed he was trying to speak to Foy because Ramires was pushed by Villa striker Gabriel Agbonlahor, who had been substituted.